I am SO impressed by your ability to put together a recipe — and such a beautiful plate job on your FIRST go-round! Kudos. Didn't realize this photo wasn't actually from L'Express until I read Jessica's comment. Looks very close to my favourite dish at L'Express! Going to use your recipe tomorrow! Their service and atmosphere, wine list, deserts, seasonal appetizers, etc and late nights are something that I miss a great deal since leaving Montreal. Not to mention their breakfasts! Hi Gordon! 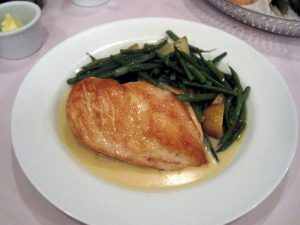 It is in fact the picture of the dish from L'Express. I do love this restaurant too… but I love Montreal! I hope you enjoy! I've not enjoyed breakfast there… but must try it next time!